This edition of MRM’s Daily Bite features Grubhub and Jack in the Box, Preoday, Olives from Spain, Sirved.com, Marketing Vitals, Paula Deen and the Poarch Band of Creek Indians and Batch & Brine. Grubhub is partnering with Jack in the Box® to provide delivery for hundreds of locations across the country. Grubhub’s network of 15 million active diners will now be able to enjoy menu items such as the Buttery Jack® burger, seasoned curly or regular fries and the fan favorite two tacos, simply by ordering from Grubhub’s online and mobile platforms. Additionally, the two companies are working together to incorporate Grubhub’s point-of-sale (POS) integration into Jack in the Box’s in-house system, which allows restaurant operators to manage all of their orders, both in-house and delivery, from one device. Grubhub’s POS integration raises the bar for in-house restaurant technology efficiency by eliminating the need to use multiple tablets, offering restaurant employees a streamlined restaurant operations experience. This means more time for staff to focus on what matters most: serving up delicious food. Online ordering and delivery from Jack in the Box via Grubhub is now available at hundreds of locations in over 20 markets, including Los Angeles, San Diego, San Francisco, Dallas, Phoenix, Denver, St. Louis and Las Vegas. To kick off the partnership, the companies will offer free Jack in the Box delivery, with minimum purchase, from all available stores, May 10-16, 2018. Grubhub plans to expand to hundreds more Jack in the Box locations throughout 2018. Research from Preoday reveals findings on consumer attitudes to third-party mobile and online ordering providers such as Deliveroo and Just Eat which charge commission fees; 70 percent say they’d rather order direct, preferring that their money goes straight to the restaurant, not a third party. Only 15 percent said they didn’t really care how much money the restaurant received from their order. The response came after consumers were informed that 68 percent of food and drink professionals, questioned by the digital ordering technology provider pay commission fees to their digital ordering technology supplier. Prior to this information, 74 percent had already said that they order food online or through a mobile app: 30 percent used aggregators* while 23 percent went straight to the restaurant to order; 21 percent said they look at both options and decided at the time. The shift in opinion is apparent; when given the full story, consumers want restaurants to take their money, not technology suppliers. Of the professionals whose restaurant businesses give customers the opportunity to place food orders online or via a mobile app (be that an aggregator or their own branded platform), 25 percent are paying more than 20 percent commission per order, only 16 percent pay less than 10 percent. Questioned on whether they thought the commission fees they were being charged were fair; only 12 percent of operators said that they were – 82 percent said they were too high and 33 percent went so far as to say that the fees weren’t worth the result. Investigating this point, Preoday found 38 percent of the questioned professionals would rather their business had its own ordering website/app than use a third-party provider; only 14 percent thought that it’s better for a brand to have a third party app than use its own order or delivery app. Worryingly, 38 percent claimed that that once a business has started using a third-party ordering technology, it’s difficult to break away. Preoday’s research further explored the access to customer data that digital ordering technology providers give clients. It found that, of those food service businesses offering a digital ordering service – whether own-branded, or through an aggregator, 44 percent aren’t given access. Considering the important role that data plays in understanding customers, enhancing marketing and giving a personalised service, it shouldn’t be surprising that 43 percent of professionals said they believe third party apps – many of which withhold data – interfere with the direct relationship between a restaurant/bar/pub and its customers. Preoday’s report reflects the anonymised responses of 476 consumers and 205 food and drink service professionals, based in the UK, during March – April 2018. Part of a nationwide initiative celebrating European table olives, Olives from Spain, the Inter-Professional Table Olive Organization, with the European Union announce the “Have an Olive Day” campaign in the city of Chicago with ambassador Chef José Andrés in tow. On May 8, “Have an Olive Day” debuted in Chicago during a tasting at Landmark West Loop, where Chef Andrés championed olives with a delicious presentation. Showcasing the wide variety of European table olives, the history of the products, and the infinite ways to enjoy them, he spread appreciation and knowledge in a menu with exclusive recipes with European olives including paella with Manzanilla stuffed with pimiento and white chocolate lollipops with Hojiblanca. The United States is the main destination for European olives, and most of the olives consumed in the U.S. (more than 83 percent) come from Europe. The U.S. imports more than 299 million pounds of olives each year, estimating in value of over $400 million annually. An essential element of the Mediterranean diet, olives can be enjoyed whole or in a variety of other forms and recipes. 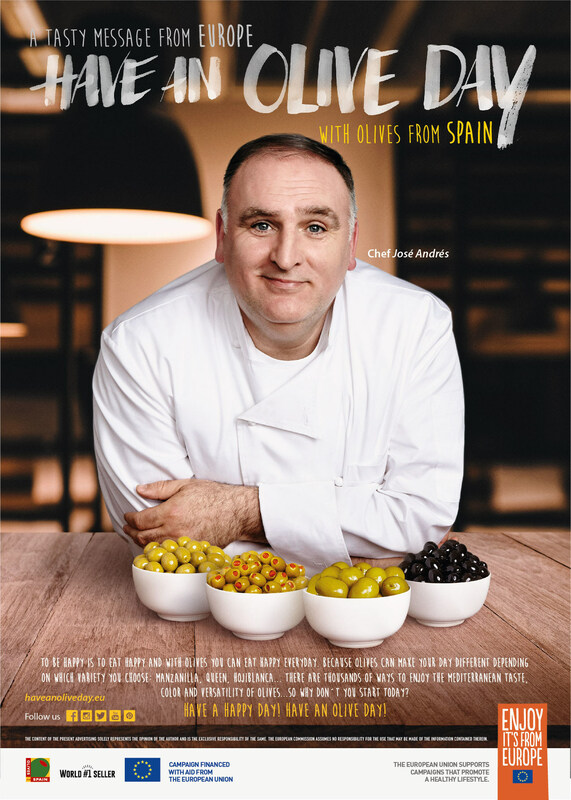 As the culinary expert, Chef José Andrés connects with consumers and influencers to showcase how special olives are, and how easy – and tasty – it is to incorporate olives into a daily lifestyle. The ‘Have an Olive Day’ campaign will run through 2019, making stops in various cities across the U.S. with heavy olive consumption including New York City, Miami, Los Angeles, San Francisco, Philadelphia, and Chicago. Sirved.com is a new search engine and mobile app tool dedicated to menu discovery that empowers people to find rare, unusual, obscure foods and almost any food people crave, served at local restaurants in any city or town. 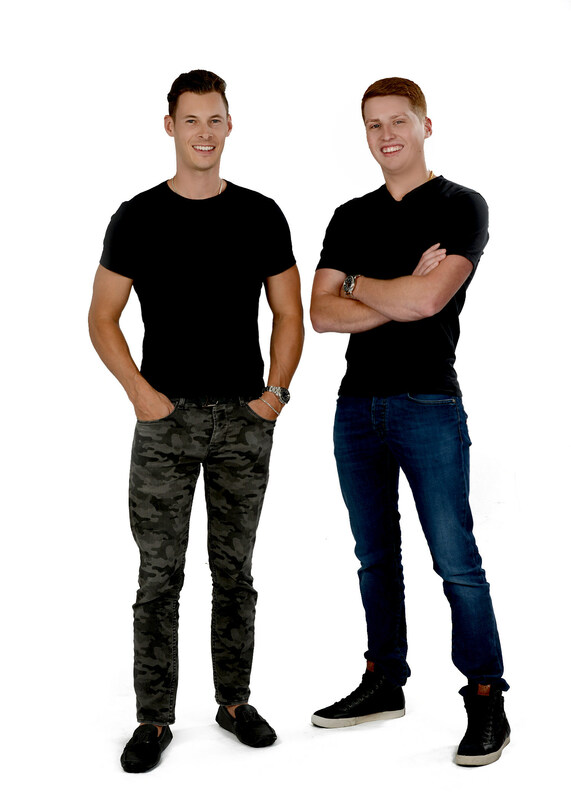 Jonathan Leslie, alongside co-founder Kyle Brown and Chief Technology Officer Derek Watts of Sirved have utilized A.I. (Artificial Intelligence) algorithms and new techniques for organizing big data. They have successfully developed a laser-fast, laser-focused menu search engine that empowers people to search for the exact food they are craving and to find it in a local restaurant. Finding a restaurant menu and specific food items online is hard – Sirved makes it as easy. For example: When people search for “tikka masala,” Sirved will give you a list of every restaurant with this on the menu, show you where it’s listed on the menu, as well as the restaurant information (distance, address, contact, etc.). This iOS and android menu app also works exceptionally well for common foods like wings, burgers, steak, etc. Marketing Vitals will be enhancing their platform to include demographic and psychographic data from Zipscene to give their customers the added ability to enhance their guests’ dining behavior segmentation with added demographic and psychographic information. “We help restaurants gather and analyze data to help predict consumer behavior that will drive frequency,” said Rom Krupp, Founder & CEO of Marketing Vitals. “By adding the Zipscene features, we are elevating this ability even further.” Krupp said the integration will be rolled out in phases with plans to demonstrate the first phase at the 2018 National Restaurant Association Show in Chicago. “By integrating our BEHĀVRL 2300 customer data with the Marketing Vitals platform, customers will be able to create unlimited consumer segments against up to 300 demographic and psychographic data points and 2300 item-specific affinities,” said Colin Klayer, Chief Product Officer at Zipscene. “Brands will have access to various transactional behaviors including spend, frequency, and category or item purchasing across distinct segments of consumers.” Because they both easily connect to over 20 of the most popular POS systems, Zipscene is able to bring a seamless technology integration to Marketing Vitals’ customers. Paula Deen and the Poarch Band of Creek Indians announced plans to open Paula Deen’s Family Kitchen at OWA – an entertainment destination in Foley, Alabama, top photo. OWA spans 520 acres and includes a 21-ride amusement park, an indoor arcade, a 150-room Marriott TownePlace Suites, 16 outdoor Sports Fields, 65,000 sq. ft. indoor Event Center, and 168,000 sq. ft. of retail and dining opportunities. Paula Deen’s Family Kitchen exemplifies traditional Southern hospitality and brings her famous family recipes, including Paula Deen’s Southern Fried Chicken, to the restaurant table. “I have selected my favorite recipes to serve to my guests’ family-style in an atmosphere just like my home. It’s all you can eat, so come hungry y’all!” said Deen. The Foley restaurant is the latest announcement in the expansion of the Paula Deen’s Family Kitchen brand, which also has locations in Pigeon Forge, Tennessee; Myrtle Beach, South Carolina; Fairview, Texas and San Antonio, Texas. The restaurant will be accompanied by a retail store featuring items that have been hand-selected by Paula Deen to reflect her gracious taste and Savannah’s rich cultural heritage. Many of her favorite products will only be found in the retail store inside of Paula Deen’s Family Kitchen restaurants. Phoenix Hospitality & Entertainment and its subsidiary, PD Restaurants, LLC, bring more than 150 years of collective experience in the restaurant, hospitality and entertainment worlds to project. “We are confident that the consistent high-quality food and service of Paula Deen’s Family Kitchen will be warmly embraced year around by the regional visitors and sports teams as well as residents of Gulf Shores, Orange Beach and Foley, Alabama alike,” said Rajat Shah, founder and CEO of Phoenix Hospitality & Entertainment. Batch & Brine, a family-owned and operated world craft kitchen and cocktail bar located in downtown Lafayette, California, will open in early June 2018. Inspired by treasured family recipes passed down through generations, the menu showcases burgers, sandwiches and shareable plates that bring world flavors to America’s traditionally favorite foods. The name Batch & Brine represents the preservation of the family’s culinary techniques, as well as their appreciation for small, sustainably produced local batch beers, wines and spirits. Batch & Brine is owned and operated by a group of siblings and cousins with roots that extend from New Mexico and the Mediterranean to California. Siblings Mike, Rolla, and David Ghaben, together with cousins Sam Ghaben and Celina Gonzales, and their son Victor Ghaben, brought in Executive Chef David Suarez to lead the culinary creation process. Left to right: Mike Ghaben, Celina Gonzales, David Ghaben, Rolla Ghaben, and Victor Ghaben. Not pictured: Sam Ghaben. Photo by Chris Andre. Brought up in their family restaurants La Ultima of Oakland, Danville and Walnut Creek, and Hof Brau and Hubcaps of Walnut Creek, the Ghaben/Gonzales family now has three generations of experienced restaurant owner-operators that oversee multiple East Bay locations of Mel’s Diners and Black Bear Diners and two Broderick Roadhouse locations. “After years of successfully owning and operating more than a dozen restaurants for major franchising brands, we wanted to get back to our roots and create a place where we could make and share our own favorite foods and family recipes. 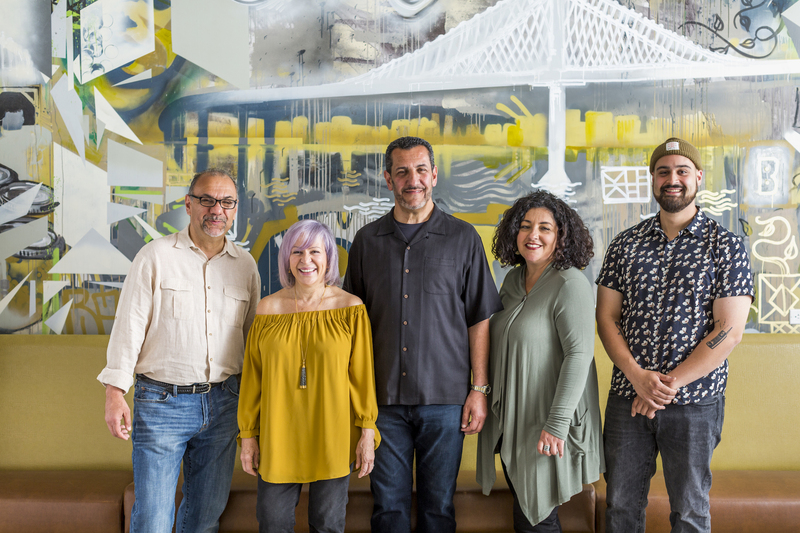 At Batch & Brine, we have brought our multicultural background, creativity and extensive culinary experience together to create something absolutely amazing and unlike anything else in the East Bay,” said Gonzales. With a menu rooted in the family’s passion for bold flavors and seasonal food, the ownership team and Executive Chef Suarez, an alum of the French Culinary Institute and former culinary director for Rosa Mexicano, are expanding the definition of the classic burger at Batch & Brine, and also offering hearty appetizers, salads, sliders, loaded fries, and weekend brunch. At Batch & Brine, burgers are the main event, but these burgers are globally inspired and take the concept of a hand-held meal to a new level. On the opening menu, guests will find nine, crave- worthy burger creations blending flavors and ingredients that celebrate the family’s Mediterranean and New Mexican heritage. Must-try burgers include patriarch Zafer Abu- Ghaben’s Kufta Burger and Falafel Burger, Chef Suarez’s Steak au Poivre Burger, and Victor Ghaben’s Hatch Chile Burger, featuring the one-of-a-kind “Hatch” chile, which is grown only in New Mexico’s Hatch Valley. 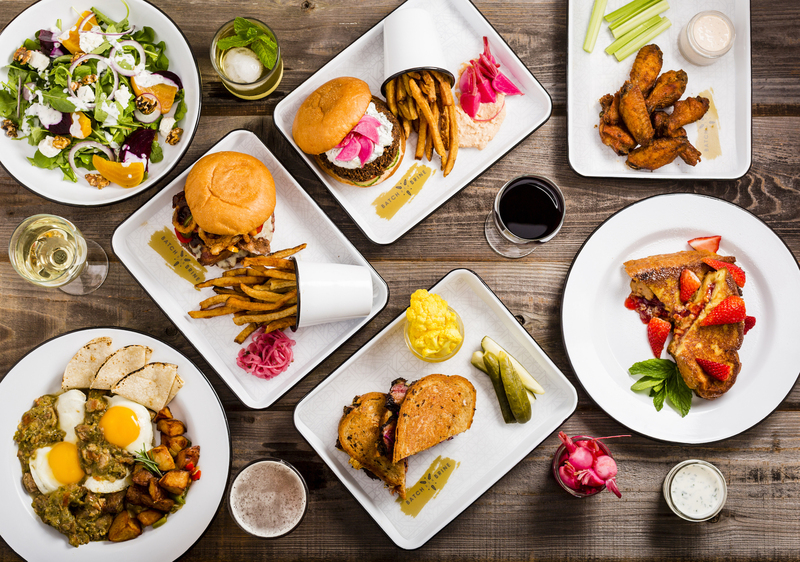 Other staples on the menu include pickle-brined chicken and house- made pastrami sandwiches; kale, beet, cauliflower or grilled ribeye salads; the Shaved Ribeye Bao Slider; and a French fry selection topped with duck confit, Hatch chile verde, or pastrami and cheese. The Batch & Brine brunch menu features an array of eggs Benedict options, such as Salmon, Veggie, Southern and Traditional, and signature dishes such as the PB&J Stuffed French Toast, Chile Verde with Eggs, and Chicken-Fried Ribeye Steak and Eggs. Led by mixologist Casey Carr and wine consultant Nate Hudson, Batch & Brine’s beverage program offers rotating, globally-inspired craft cocktails and spirits that complement the menu, a wine selection of small-production artisanal wines available by the glass, and 20 craft beers on tap. Featuring a creative, modern design by Crome Architecture and finishes by Anne Sacco Interiors, the space combines neighborhood cool and upscale fun. The architectural layout is reminiscent of a classic tavern or whiskey bar, but with an overlay of modern finishes such as geometric tiles, tall windows and contemporary art in an indoor-outdoor space that perfectly suits Lafayette’s warm climate. The light, open and airy restaurant space offers a dynamic dining ambiance with custom-painted murals by Berk Visual, known for his illustrations and street art. The dining space includes communal tables, booths, a lounge area, an interactive activity board, and a colored cement bar which serves as the focal point of the restaurant. In addition to custom murals, Berk Visual has also designed menus, coasters, tee-shirts, inlays, and funky bathroom stalls, exclusively for Batch & Brine. The exterior of Batch & Brine is wrapped in reclaimed wood with carefully placed living walls filled with indigenous succulents. The large, wrap-around patio space in front of the restaurant features additional lounge seating, a fire pit, communal and bistro tables, market lighting, and forged iron finishes, creating a setting unique to downtown Lafayette.